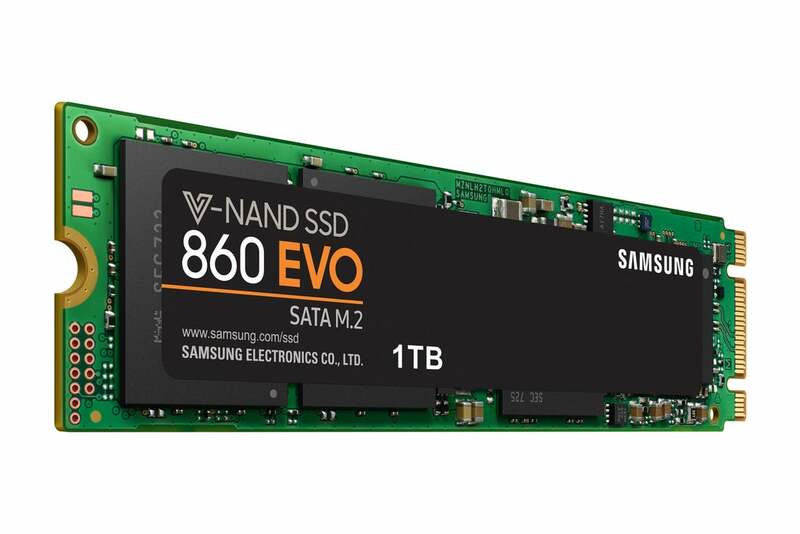 The 860 EVO performs as well, or better than, most MLC-NAND SSDs we've tested. We even quadrupled our normal 20GB copies, and the 860 EVO easily maintained the pace. In fact, despite being quite a bit cheaper, the 860 EVO's performance compares more than favorably with that of its 860 Pro cousin. You can check out all our SSD reviews in the full roundup. Though the 860 EVO is available in the 2.5-inch form factor, we tested the M.2 2280 (22mm across, 80mm long) version in the 1TB capacity. Both are SATA 6Gbps and available with up to 4TB of capacity. Fitting that much storage into something little bigger than a stick of gum is quite the achievement. The controller is Samsung's own MJX, and the NAND it's feeding and reading from is Samsung's own stacked/layered/3D 3-bit TLC. The 860 EVO is Samsung's answer to the TLC sustained-write lag. And the answer is there isn't any, any longer. As to the controller, I didn't speak to Samsung about it, but the scuttlebutt I've heard around the industry is that while TLC (when written to its full 3-bit capacity) is indeed slower than 2-bit MLC or 1-bit SLC, it's been primarily the controllers that have held back performance. The latest generation of controllers apparently knows how to cope with the slower write times. Whether this translates into increased latency (the time between the data's being captured to the drive and permanently written) hasn't been discussed. Initial pricing for the 860 EVO is $95 for 250GB, $170 for the 500GB version; $330 for the 1TB flavor we tested, $650 for the 2TB version; and the 4TB version is $1400. On a per-gigabyte basis, that's around 31-35 cents, while the 860 Pro varies between 47 and 51 cents per gigabyte. Note that the 860 Pro offers slightly more storage per capacity in the smaller sizes, at 256GB and 512GB. The 860 EVOs are rated for 600TBW (TeraBytes Written) for every 1TB of capacity over their lifespan. This is about half what the 860 Pros are rated for, but typical for the low end of the market, and far more than the average user will ever write. By just about every metric, the 860 EVO is the fastest TLC SATA SSD we've tested, if only by a slim margin. But it's a clear improvement over the previous 750 and 850 EVOs, and faster than many MLC SSDs. In the performance charts below, the 860 EVO is the turquoise-colored bar. 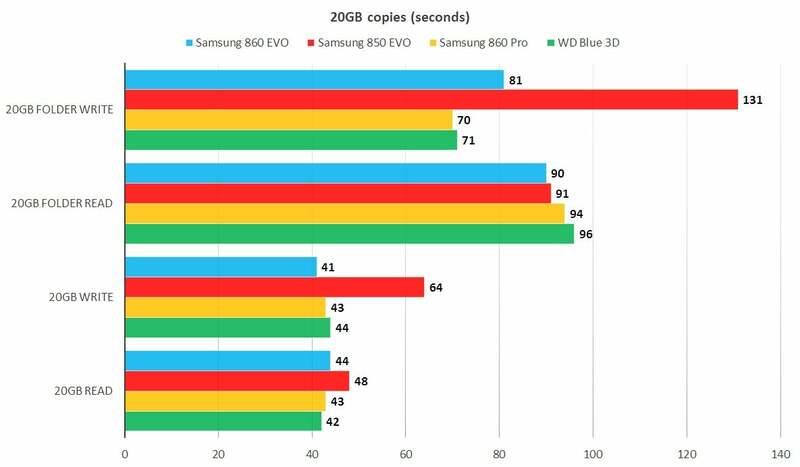 The 860 EVO (turquoise bars above) is a clear improvement over the 850 EVO and on a par with the best of the latest TLC-NAND SSDs such as WD's Blue 3D. As you can see above, there's not a lot to choose from between the 860 EVO and the WD Blue 3D (green bars), but the older 850 EVO (red bars) is clearly a step behind with sustained transfers. AS SSD has the same thing to say about the competing SSDs as our 20GB copy tests. AS SSD, shown above, reveals the same story. 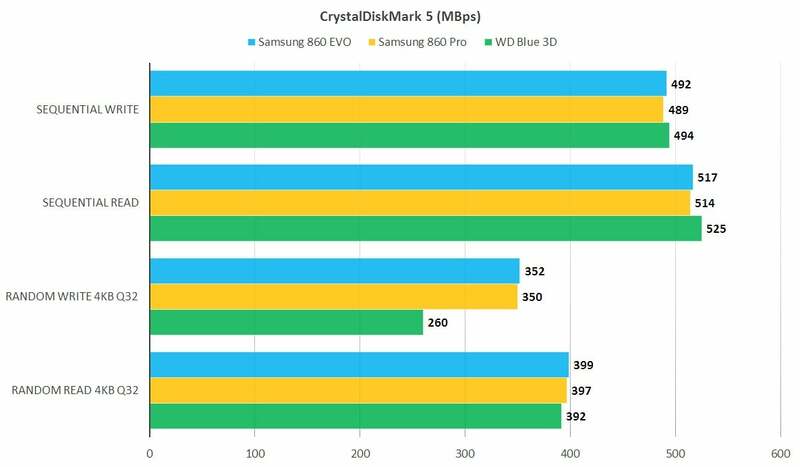 CrystalDiskMark (shown below) calls out the one area, small queued writes, where the 860 EVO clearly outperforms the WD Blue 3D. CrystalDiskMark showed the one area where the 860 EVO clearly outshone the WD Blue 3D--random queued writes. Same-model SSDs can vary drastically in performance according to their capacities, because the less capacious models have fewer chips and pipelines for shotgunning data. Samsung rates all its capacities the same for the same performance. We didn't have other capacities to test, but based on previous testing and experience, we find this claim likely to be just. 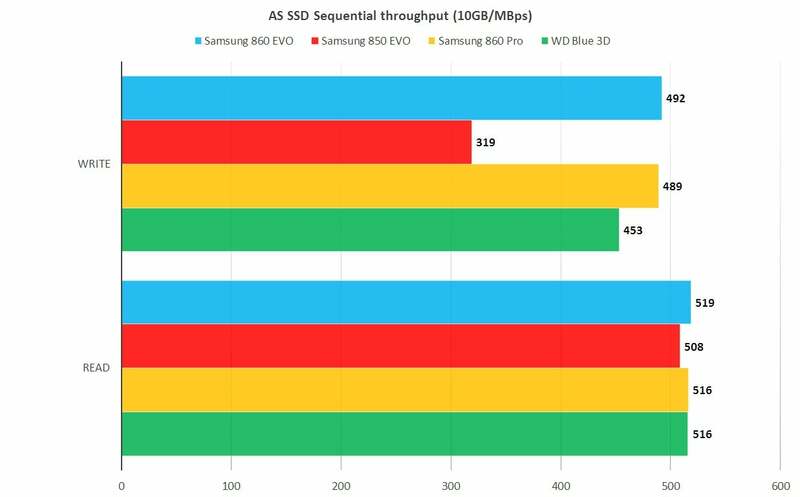 As sustained write speed is no longer a concern with the latest TLC SSDs, the only reason to go with an pricier MLC drive such as the 860 Pro is if you're concerned about longevity or write far more data daily than the average user. Note that the average SSD is rated for at least 10 years averaging 10GB of writes a day. And privately, vendors are convinced they'll deliver more. That's not a promise, just reassurance for the faint of heart. The 860 EVO is the fastest TLC SSD we've tested, albeit by a gnat's eyebrow. But a win is a win, and given the same price, we recommend it over the WD Blue 3D and Sandisk Ultra 3D. That said, you'll be more than happy with any of the three, so if you find the latter two significantly cheaper, go for it. Subjectively, you'll never be able to tell the difference. Caveat emptor: There are still lots of older TLC SSDs out there with slow to pitifully slow sustained writes. Shop carefully, and of course, read our other SSD reviews.